A countryside feeling with the first City-Gardens in rural areas! At the dawn of the 19th century, the magnitude of a rural exodus to the towns created growth problems. Industrial towns were confronted with two realities: develop the existing towns or move the towns to the countryside. These two options were not conflicting ones but rather cohabiting ones for their motivations were the same : health of the citizens was the concern on which hygienists based their speech. It was in this context that we saw the emergence of garden-cities such as (Stains, Saint-Denis, Drancy), allotments gardens (Pantin), subdivisions (Tremblay-en-France) and affordable housing. Industrialists, local representatives and hygienists found themselves stuck in the middle of these progressively dilapidated towns (but where the factories had to be quite close together), and the desire to strive for a form of “an urban Eugenism”. The most radical strategy was that of the garden-cities. It was Ebenezer Howard (1850-1928), an Englishman, who was first to think of bringing the towns to the countryside. He imagined “garden-cities” to literally work for themselves in order to decongest the large industrial overpopulated and disorganized cities. In 1898 he published a book called To-morrow, a peaceful path to real reform, in which he fixed his objectives : “Town and country must be married and out of this joyous union will spring a new hope, a new life, a new civilization”. Howard set the optimal number of residents in these garden cities to about 30,000 as everyone had to have a job there. Three major activity sectors were concerned: agriculture, industry and services for which Howard fixed quotas and implementation regulations on the territory. The concentric urban planning of these Garden Cities made for a large garden in the center in which public facilities were provided: City Hall, concert hall, theater, library, museum, municipal dispensary, etc. Among the first constructions of this type in France, the garden city "La Ruche" was found in Saint-Denis and was the work of Georges Guyon, one of the first architects to think about social housing. In 1890, an architectural design competition was launched by the “Société des Habitations Economique” in Saint Denis to create social housing in la Plaine Saint-Denis. La Ruche was an operation of sixty seven housing plans where houses were built amongst yards and gardens. Constructed between 1891 and 1893; it was the first affordable housing project supervised by the “Siegfried law” creating thus the first public financial scheme for public social housing. 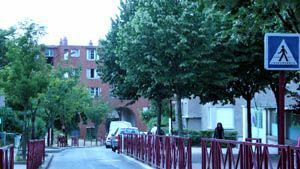 Georges Guyon made other accommodation structures in Saint-Denis including the working class council estates on rue Prairial. It was Henri Sellier (1883-1943) who was behind the most important Garden cities in the Paris region. As the Minister for public health, he contributed to the construction of fifteen Garden Cities around Paris. He founded in 1916 the “Office Publique Habitations Bon Marché de la Seine” which allowed for the acquisition of the necessary land for the construction of the Garden Cities in the suburbs of Paris. Suresnes, where he was elected as mayor of the town in 1919, was the most impressive. Sellier worked with a dozen architects strongly convinced by the necessity of Garden Cities. Directly inspired by British achievements and the idea of the “cottage”, the team imagined, at first, picturesque villages weaving in and out of this esthetic suburban vernacular architecture of high roofs and tall chimneys. Green material was widely used to give the idea of space. One of the first implementations of Garden cities in the former department of the Seine was that of Drancy. Built by the architects Joseph Bassompierre and Paul De Rutté, the Garden City of rue de la Republique included 210 collective dwellings grouped into estates or detached houses which were mostly localized in a rural area in Drancy, the present-day city center. The first houses were built in 1920 and 1921 and leased to Railway workers. They were made of red brick, sometimes made of pebbledash, topped with a tiled roof. A second wave of construction work in 1929 and 1930 differentiated the houses by their roof terraces and included semi-collective housing. The whole featured constructions where variety and asymmetry broke away from the usual monotony of housing estates. The garden-city in Drancy suffered partial destruction in 1996. The garden city of Stalingrad Square in Blanc Mesnil came after the one in Drancy. It was also built by the Company of Northern Railways to house its employees. Construction work was entrusted to Hector Caignard de Mailly, a Parisian architect who built several garden-cities in France in the 1930s, including those of Tours (in 1927/1928), Poissy (1930) and Livry-Gargan (1933). Caignard was also the architect who designed the church Sacré-C½ur in Blanc-Mesnil. The Garden Cities houses designed by Hector Caignard were all more or less built the same way with a concrete mass covered with millstone. The concentric form of the Garden-City in Stalingrad Square shows, from the sky, the shape of a locomotive wheel. Originally, the square was designed by a landscape gardener and was known as Concorde Square. No less than twenty two garden cities were built in this future territory that was to become Seine-Saint-Denis, providing thus, seven thousand future housing options. They did not all have the same importance: some have disappeared; others were renovated or refurbished such as the Garden City Albert 1 in la Courneuve, the one located in rue des Sablons at Lilas (architects Pelletier and Teisseire 1921/1923), the city-garden- des-Pommiers (built by Félix Dumail in 1922, expanded in 1938), Saint-Vincent-de-Paul Garden City in Villetaneuse (in 1920) or, later, the garden-city of Noisy-le-Sec, built in the 1950s, allée de la Libération. 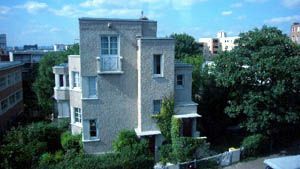 Garden cities in les Lilas was built by the architects Pelletier and Teisseire between 1921 and 1923 for the first part and 1931 for the second. 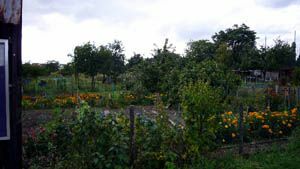 It was situated rue des Sablons, near the town center on land covering more than six hectares. The layout of the road network was very simple as it consisted of one main road serving all no-through streets. However, the different ways of grouping the buildings offered a very diversified visual perception. The first part included only bungalows or houses with one floor and a garden. The 197 pavilions (with 212 housing options) were built with a limited life expectancy scheduled for fifteen or thirty years. There was no bathroom or central heating. Despite a common core plan, the houses were made according to different typologies, in particular the position of the openings and the volume of the roofs. Between 1971 and 1973, these timeworn houses were demolished. Unlike the first, the second part only offered collective housing on two floors. The 106 accommodation options included: from one to five rooms, comprising a kitchen, bathroom, toilet and storeroom. They were equipped with central heating. Better-built and more robust than the pavilions, collective housing in the Garden-city in Les Lilas continue to be occupied today. In Stains, the architects Eugène Gonnot and Georges Albenque created from 1921 to 1933, a city within the city, the Garden city which was built on the land of the park of the former castle which was destroyed during the war in 1870. Built to house in priority the working population working in the factories in Saint Denis, Le Bourget and la Courneuve, this lively neighborhood sprang up to contribute to the social success of this exemplary model of community life. In this vast project, housing is either in the form of pavilions with gardens, grouped into two, four or six, individual houses or apartment buildings. The plans of the latter depended on their urban installation: T shaped-buildings, at an angle, redents on the street alignment to limit the effect of linearity or parallel to the street (just like14 avenue de la Division Leclerc). Despite the standardization of components, different façades were made by adding standard elements: bow-windows and balconies with columns (18 avenue de la Division Leclerc), some of them were sometimes crowned with turrets (2 avenue de la Division Leclerc). The houses were also built on the same model: use of bricks covered with multi-colored-pebbledash, with tiled-roofs or terraced-roofs. The differences here were seen in the design of the openings (avenue Paty). The architects designed the whole city garden plan based on the former town centre. The new district was designed as a spider’s web, each “web” representing a street and the square Marcel-Poiret in its centre. The rows of trees along the wide avenues reinforced the “monumental” perspective to the heart of the city. Provincial plots of land punctuate the urban landscape, while paths, almost like nature trails, weave in and out of the gardens. Garden-Cities in Stains has 1676 dwellings divided into 456 pavilions and 19 buildings with 3 or 4 floors. It has hardly undergone any transformation since its creation and its heritage value was recognized in 1976 by its registration as a site to be visited. Don't miss the other special pieces of urbanism in the area !